Customised old bikes are ten a penny right? Well not this one. Gone is the petrol engine and about 90% of the other parts of the bike, replaced with the battery pack from a Nissan Leaf. Say hello to the Leafy Savage from Nightshift Customs. The frame is from a 2003 Suzuki Savage but the original 650cc thumper is long gone, replaced by the Lithium battery pack from a Nissan Leaf that has been wired in series to deliver 116v. Power is now supplied by an Enertrac hub, which peaks at 40hp and has a continuous output of 13hp. A Kelly controller mounted under the seat allows quick adjustment of the power curve – a balanced city riding set up it gives a range of around 100 miles. 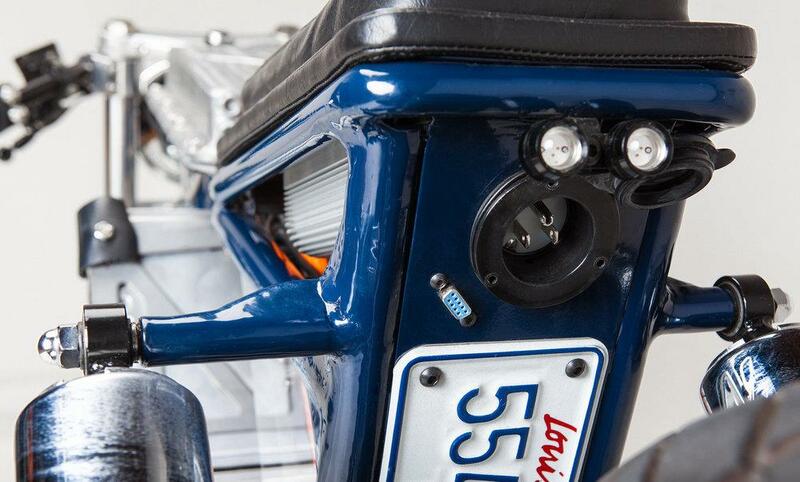 Replacing the petrol tank is a 3000w charger that can connect to any household power outlet through an extension cord under the seat and charge the bike to full in less than three hours.